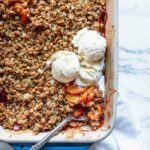 For this stone fruit crisp, combine any summer stone fruit you like — peaches, nectarines, plums, apricots — with a buttery brown sugar oat topping, bake it until browned and bubbling, then sit back and take bets on how long it will last.
. You don't need to bother peeling them unless you want to. Place the sliced fruit in a 9x13 or 3 qt baking dish. Sprinkle brown sugar, cornstarch, cinnamon, nutmeg, and lemon juice over the sliced fruit. Gently toss it all together until evenly combined. In a large microwave-safe bowl, melt the butter. Whisk in brown sugar, cinnamon, and salt. Stir in the flour, oats, and nuts (if using). I found that it was easiest to mix together with my hands at this point so that everything was evenly distributed. Scatter the oat topping evenly over the fruit. Bake for 55-60 minutes, or until the topping is golden brown and you can see the fruit filling bubbling up the sides. Let cool for a few minutes before serving warm with vanilla ice cream, or, if you want to be more virtuous, yogurt. See how long it lasts. *This was about 10 smallish peaches, plums, and nectarines for me, but the weight is the more accurate measure. Store any leftovers in the fridge for a few days, and reheat individual servings in the microwave.